...The Holiday Meal Recovery Unit Edition! Alternatively titled, Not Without My Sister, from the perspective of everyone's favorite Scaredy Pumpkin, Seamus O'Lantern. Bet you didn't know Seamus has a sister eh? Well, he does and his precocious, talkative female sibling goes by the name of Leah. That's right, Leah O'Lantern. ...Wait a minute. Pumpkins don't have manes! 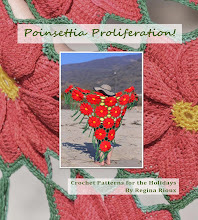 It is common knowledge that members of the Cucurbitaceae Family are follicularly challenged. So what's a young Pumpkinette to do with all of her TiGi hair products sans locks? Leah also enjoys faux lashes with her locks. 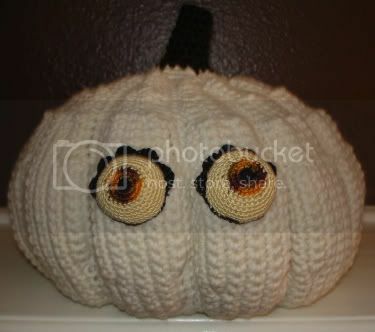 This Pumpkin Princess may have watched Priscilla Queen of the Desert one too many times me thinks...I digress. Please note that hair is REMOVABLE. In addition to her innate style, precocious nature, ubiquitous opinions and bossy demeanor, young Leah O'Lantern is also quite gregarious. This little Pumpkinette could strike up a conversation with a wall if needed. Unfortunately, talking to anyone, anywhere, anytime is not always a wise practice for a little Pumpkin girlie around the holidays as Pumpkin and Pumpkinette Pie are considered a staple on nearly every Thanksgiving Day table in the United States. So, who did Leah unknowingly find herself engaged in deep and thoughtful conversation with regarding the virtues of pump vs. aerosol hairspray just days before T-Day while strolling around the neighborhood patch? Unfortunately for Leah, she was talking to none other than a couple of corporate buyers from Libby's. Now the guys at Libby's like Pumpkins. They like them a lot. In fact, their Pumpkin Pack is a big seller this time of year so they ditched their earplugs for a grain sack and snatched the little Pumpkinette up with the hopes that her speech would cease when pureed in a can. Now, it didn't take long for her family to notice that Leah was gone, for when it is quiet in the O'Lantern household that can only mean two things: (i) Leah is asleep or (ii) Leah is not there. The little Pumpkinette was not in her bed. She was not in the house. Nor was she in the neighborhood patch. In fact, Leah was nowhere to be found. Siobhan O'Lantern, matriarch of the O'Lantern clan, was visibly distraught by her daughter's disappearance and immediately sought answers to the whereabouts of her daughter. Fortunately, there were plenty of eyewitnesses to the Pumpkin-napping of her Sproutling left in the neighborhood patch and they readily informed Siobhan and the rest of the O'Lantern clan of the Pumpkin Abduction of Leah O'Lantern (made-for-television movie in the works). Siobhan O'Lantern, despite her worry and grief, had enough clarity upon hearing the tale of her daughter's nefarious disappearance to remember that the Holiday Meal Recovery Unit ("HMRU") was readying itself for T-Day Operations over at VLA Headquarters. She immediately elected to send her youngest son, Seamus, to go to VLA HQ and enlist the HMRU's ground support in order to extract and recover her beloved Sprout from impending puree-ification. Frightened but determined, Seamus sought out the Veggie Warriors even if his sister was bossy, wore funky wigs and talked way too much, for Seamus loved his sister, Leah, after all and he didn't want to see her come back to the family in a can. Needless to say, the brave HMRU combatants were able to rescue Leah from the Pumpkin Squashing Facility located in the Libby's Factory with the help of her formerly frightened brother, Seamus. Yes, Seamus stuffed his scaredy feelings beneath his seeds and played a pivotal role in the successful rescue and recovery of his little sister just minutes before she was about to be squashed, pureed and stuffed in a can! The entire harrowing operation was completed using nothing more than a butter knife, mint-flavored dental floss, and a balsa wood airplane. Amazing! Stay tuned! More Holiday Meal Recovery Unit tales to fill your December days and nights! 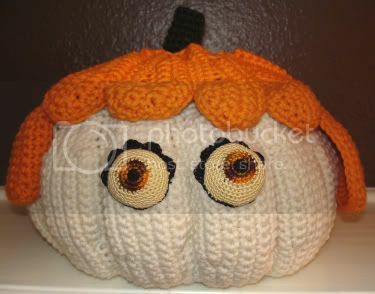 love squashette and removable hair - isn't it amazing how hair can just change the personality of a crochet vegetable. 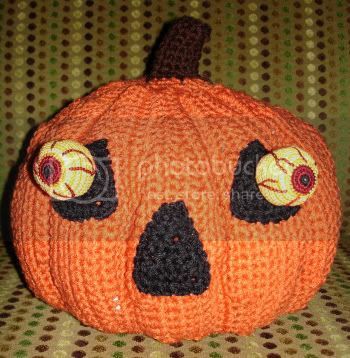 And in a weird case of syncronicity, last Halloween I was a pumpkin with a green crocheted wig. Leah and Pam. Switched at birth? 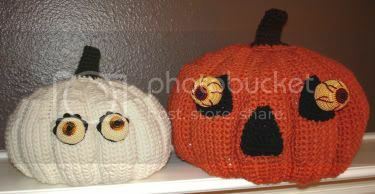 How cute are those pumpkins! BTW, I loved Priscilla Queen of the Desert. Leah is adorable! Thank goodness her brother turned brave and recused her! Hurrah for Seamus!! Such a McGyver! Leah will not have seen Priscilla too many times until she puts an emu on her head. Colorful wigs rock! And Happy Pangolin Day! OMG. Love the removable hair. Although I think the eyelashes might be my favorite part. Glad to know I'm not the only one who experiences holiday freakouts. But you still seem to be getting plenty done! When is the veggie book being published? Woo hoo!! Three cheers for Seamus! So glad to hear that Leah is not going to be my Christmas pumpkin pie...ummm...not that I would ever think of eating pumpkin...or any other vegetable for that matter! Oh my--Leah's wig is too much! Wigs for everyone I say! I dont need to tell you how cool you things are, do I? Ok, well there awesome. I love your eyes. Oooo... a book! That would be awesome! I always watch Priscilla when it comes on. Of course I also watch the Rocky Horror Picture Show. Then again, I also watch Too Wong Foo. Ok, I am getting off track here. Lovely pumpkins. Does she have curly wigs too? that hair, those eyes... I'm in love!